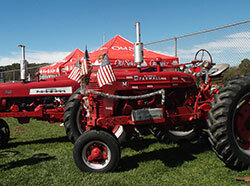 This day-long event features both urban and rural displays, antique and modern farm equipment, tools, live music, square dancing,clogging, arts and crafts, children’s activities, old timey games, wagon rides, displays, demonstrations, tractor pulls hands-on activities, and plenty of food. 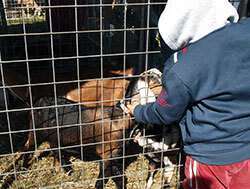 Animal lovers will enjoy the petting zoo, and a fishing pond. The old-timey games includs an egg toss, sack race and corn shucking. The Park comes alive with the sights and sounds of live regional bands, dancers and singers performing throughout the day. Farm City Day was started in 1955 by the Cooperative Extension Service and Kiwanis International. The Festival highlights the dependency of farm people and city people on each other for products and services essential to modern living. The Farm City programwas designed to encourage the exchange of ideas and development of shared activities creating a feeling of mutual understanding and good will. In 1986 Farm City Day was moved to Jackson Park. For information or a schedule of events call the Henderson County Parks & Recreation Department (828) 697-4884 or the Henderson County Cooperative Extension Service (828) 697-4891.